Fish Northwest Florida waters by boat with local experts. Whether you want to stalk redfish or trout on the flats, head further out for snapper and grouper or troll for king or Spanish, Captains James Broxson and Jason Downs know where to find them. Broxson Outdoors Charters believes in customizing the charter experience for each and every client. We provide all of the bait, tackle, rods and reels as well as the licenses, bottled water and ice. All you need to bring is plenty of sunscreen, a camera, sunglasses, a hat, a cooler to take your fish home and any other drinks or snacks you may want to have available. We’ll also supply a large cooler for you to store your additional drinks and food, and we’ll even clean your catch when we dock. When you book a charter with us, you will be fishing on one of the finest bay boats on the water – a 24 foot Pathfinder powered by a 225 HP Yamaha engine. 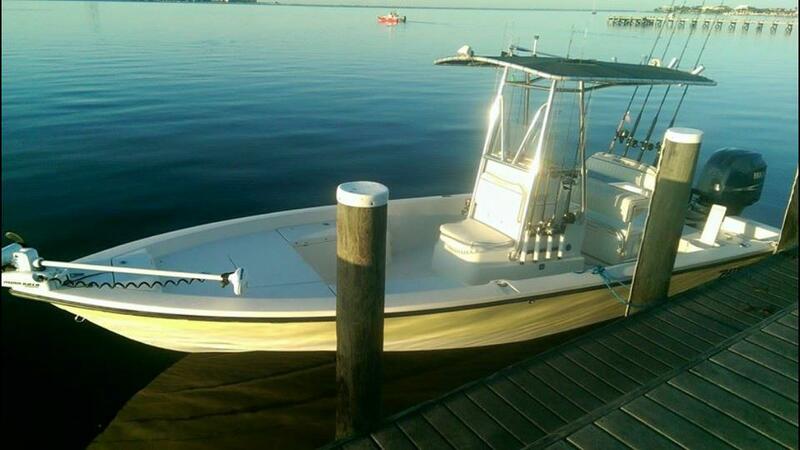 Our boat also features a t-top that gives you just enough cover on those hot Florida days. We launch from any of the local ramps and can even pick you up where you are staying if it is accessible by boat. For a current list of available trips, our rates or to book your next charter fishing adventure please contact us at (850) 936-0230.